The mega football tournament, ‘ITBP High Altitude Football Cup 2017’ concluded on October 30 at 5th Battalion ITBP ground, Choglamsar. The final match was played between Oasis and Mahabodhi in which team Oasis lifted the tournament cup. The event was funded by the Home Ministry and supported by ITBP Delhi, North West Frontier Chandigarh, Sector Head Quarter Ladakh and the entire unit of ITBP. A total of 40 teams participated in the tournament. 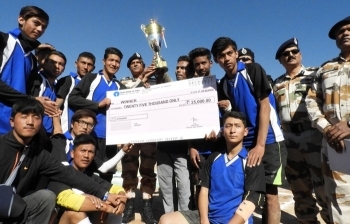 The teams who played in the finals will be sent to the different states to play with other teams in order to develop more skills and to aware people about the teams of Ladakh. JP Yadav, DIG, Sector Headquarter, Ladakh, said, “We expected very less participation in the beginning but when it started there were 40 teams and I really appreciate their motivation”. Chering Dorjay, Minister for Cooperative and Ladakh Affairs appreciates ITBP Ladakh for organizing the football match for the first time in Leh. The champions were felicitated with the cash price of ₹ 25000 and the runner-up with ₹ 20,000.